Even some of the best teams can have their off days. Barrington High had its mulligan on Saturday. The Eagles, the two-time defending state titlists and the favorite for this year’s crown, finished a somewhat-disappointing fourth overall in the Championship race of the Brown HS Northeast Invitational at Goddard Memorial State Park. Only sophomore teammates Emma McMillan and Julianna Portelli were among the top 20 in a race that most anticipated the Eagles would be battling for a possible team title. McMillian ran close to a personal best with a fourth-place time of 18 minutes, 10.8 seconds for the fast five-kilometer course. Portelli ran her fastest clocking this season, placing 20th overall in 19:19.1. Senior Abby Livingston, normally the Eagles’ No. 2 runner, suffered cramps midway into the race and finished 36th overall in 19:59.1, nearly two minutes slower than her PB of 18:16.3, set at the Great American Cross-Country Festival in N.C., on Oct. 5. Barrington’s scorers consisted of McMillan, Portelli , sophomore Julia Zitzmann (27th, 19:39.9), senior Kelsey Maxwell (28th, 19:40.5) and senior Megan Verner Crist (30th, 19:45.4). Although she was displeased with her team’s overall finish, Barrington head coach Ann Marie Marino concentrated on the positives that her Eagles demonstrated on a crisp, fall afternoon. 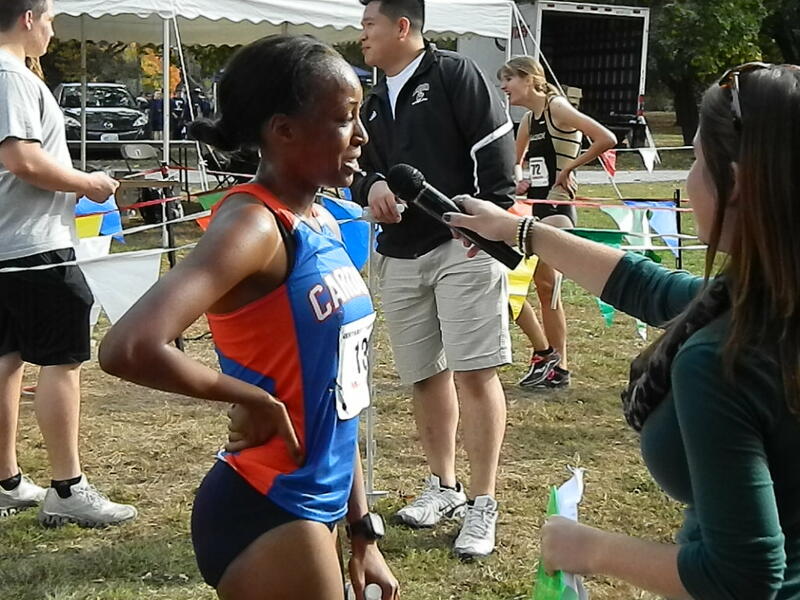 Senior Denise Branch of Benjamin Cardozo in New York, captured the individual title with a time of 17:52.2. She was followed across the line by Miller Place (N.Y.) senior Tiana Guevera in second (17:53.8) and Northport (N.Y.) senior Brigid Brennan in third (18:04.0). Northport defeated runner-up Miller Place, 69-75, to take the team plaque. Tyngsborough (Mass.) was third with 92 points, while Barrington had 96 for its placement. Cumberland, the only other R.I. team in the Championship race, was eighth with 177 points. 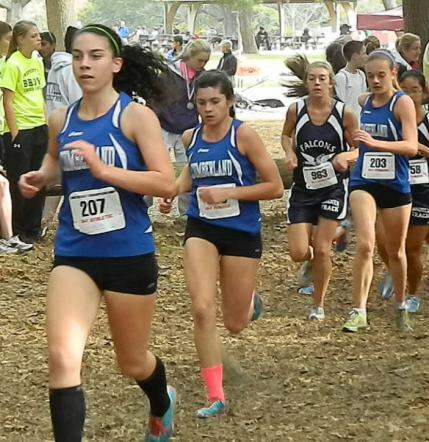 Sophomore Amy Laverty paced the Clippers by taking 16th overall with a time of 19:07.8. Cumberland sophomore Meaghan Scullin also dipped under 20 minutes, placing 26th with a time of 19:33.6. Junior Nichole Barger took 40th overall in 20:07.7, senior Hannah Tavares was 51st at 21:15.0 and senior Kerry Connolly placed 58th in 21:33.2 to complete the scoring. In a meet where only a handful of R.I. squads made the short trip to Goddard Park, Cumberland was the lone school from the Ocean State in the boys’ Championship race. The Clippers were seventh overall with 177 points. Cambridge Rindge & Latin of Massachusetts took the hardware by defeating second place and last year’s champion St. Anthony’s (N.Y.), 65-85. Alex Southiere, a senior, was the top finisher for the Clippers. He was 22nd overall in 16:16.3. 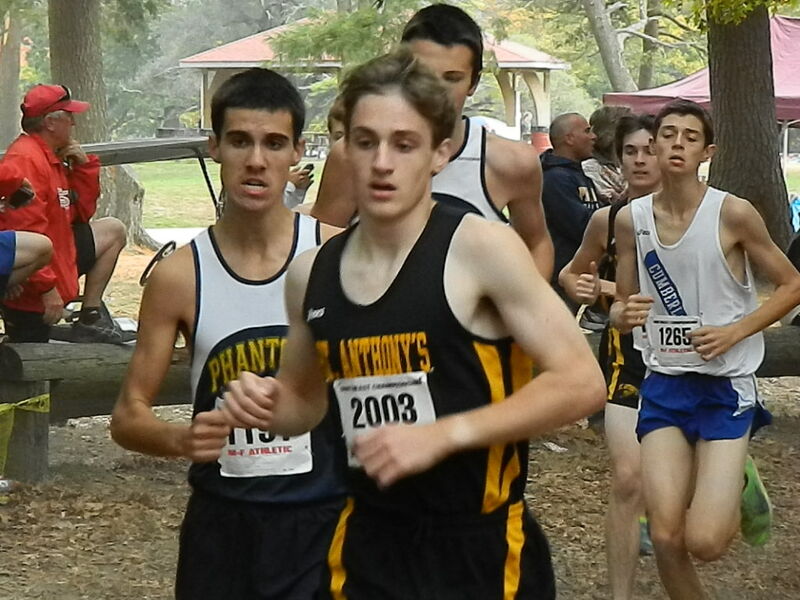 Also running strong was sophomore Sean Laverty (24th, 16:20.1) and senior Kevin Seaver (34th, 16:39.2). All three runners hit the opening mile between 4:59 and 5:01. Overall, Kenwood was satisfied with his squad’s effort. During the league season, the Clippers were 11-0 in the Northern Division. 4, Barrington 96; 8, Cumberland 177. 1 (4) Emma Mc Millan, Batt. 18:10; 2 (16) Amy Laverty, Cumb. 19:07; 3 (17) Jess Elliott, Prout 19:10; 4 (20) Julianna Portelli, Barr. 19:19; 5 (26) Meaghan Sciullin, Cumb. 19:33; 6 (27) Julia Zitzman, Barr. 19:39; 7 (28) Kelsey Maxwell, Barr. 19:40; 8 (Megan Verner-Crist, Barr. 19:45; 9 (36) Abby Livingston, Barr. 19:59; 10 (40) Nichole Barger, Cumb. 20:07; 11 (51) Hannah Tavares, Cumb. 21:15; 12 (58) Kerry Connelly, Cumb. 21:33; 13 (61) Ashley Bricault, Cumb. 21:37; 14 (65) Cailey Johnson, Cumb. 22:21. Dist. 3.1. 15, Westerly 375; 27, Prout 612. 1 (24) Katie Millar, Ex./W. Greenwich 20:05; 2 (41) Sarah Garvey, West. 20:43; 3 (52) Maddy Mc Laughlin, West. 21:01; 4 (75) Caitlin Gosiminski, Prout 21:41; 5 (76) Carrie Sisco, West. 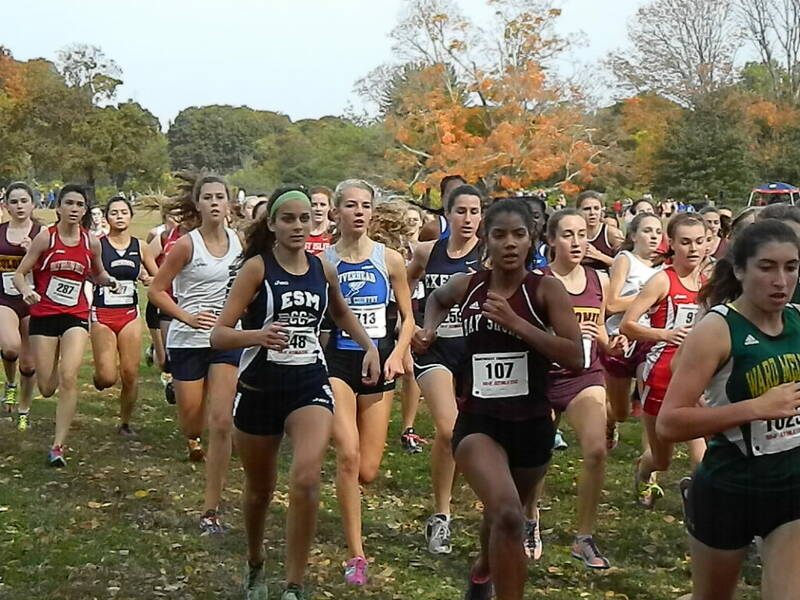 21:42; 6 (91) Kayla Harrington, Prout 22:12; 7 (93) Serenity Chen, West. 22:13. Dist. - 3.1. 1 (67) Sophie Ford, Ports. 21:06. 37, Liz Orr, West. 23:33; 55, Kyra Mc Cormick, West. 24:39; 61, Alex Beardwood, Prout 25:09; 65, Aisla Lehrach, Prout 25:26; 73, Cate Montalto, West. 25:41; 95, Michaela Muto, Prout 26:44. Dist. - 3.1. 16, Barrington 349; 16, Portsmouth 489. 51, Maddy Soutter, Barr. 22:08; 73, Annie Priolo, Barr. 22:51; 96, Chloe Mehring, Barr. 23:35; 104, Anne Aggerholm, Barr. 23:52. Dist. - 3.1. 38, Mira DeSilvestro, Prout 18:34; 46, Abby Tutt, Barr. 19:04; 66, Erin Yabroudy, Prout 20:34; 79, Skyla Strickland, West. 21:23; 85, Caeles Garvey, West. 22:11. 1 (22) Alex Southiere, Cumb. 16:16; 2 (24) Sean Laverty, Cumb.16:20; 3 (34) Kevin Seaver, Cumb. 16:39; 4 (43) Luke Emby, Prout 16:50; 5 (52) Dave Agudelo, Cumb. 17:04; 6 (56) Abdullah Kaba, Cumb. 17:10; 7 (62) Jim Haupt, Cumb. 17:23; 8 (76) Matt Smith, Cumb. 17:49. 17, Prout 435; 19, Ex,.W. Greenwich 457; 22, Middletown 621. 1 (30) Matt Dampier, EWG 16:58; 2 (70) Adam Sowden, EWG 17:51; 3 (80) Jacob Mc Connell, Prout 18:06; 4 (81), Ryan Donovan, Prout 18:09; 5 (90) Matt Matrullo, Prout 18:30. Dist. - 3.1. 8, Barrington 242; 19, Portsmouth 438; 23, Cr. West 662. 1 (27) Sam Somera, Barr. 17:00; 2 (36), Sean Blythe, Ports., 17:06; 3 (43) Luke Bledsoe, Barr. 17:11; 4 (46) Travis Soares, Barr. 17:13; 5 (60) Marc Sefranek, Barr. 17:28; 6 (66) Grant Auber, Barr. 17:38; 7 (79) Kieran Mc Gartoll, Barr. 17:54; 8 (80) Nate Zacarro, CW 17:56; 9 (88) Jack Reaper, Ports. 18:04. Dist. - 3.1. 23, Nick Curci, Prout 18:41; 31, Connor King, Prout 19:13; 39, John Pelosi, Prout 19:40; 56, Chris Joseph, Prout 20:11; 63, Ian O’Donnell, Prout 20:33; 64, Tyler Kumes, Prout 20:37. Dist. - 3.1. 42, Will Connelly, Barr. 18:12; 85, Cassidy Laidlaw, Barr. 18:58; 99, Collin Travassos, Barr. 19:16. Dist. - 3.1. 7, Prout 254; 19, Portsmouth 454.